This book uniquely presents familiar birds in unfamiliar ways. For each species group, there are images of the male and female, nest, nestlings, feeding time, and the fledglings as they take their first leap. The featured birds include songbirds, urban birds (such as raptors and pigeons), water/sea birds, and owls, all common in most areas of North America. The book begins with the fundamentals of nesting behaviours and explains why different species approach nesting in different ways. 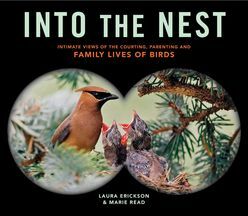 It goes into species-specific detail with amazing photographs of the entire nesting cycle and captions that explain exactly what readers are seeing. Spectacular close-up photographs by noted wildlife photographers trace the family lives of more than 30 familiar birds, from the first song of the courting male to the first flight of the fledglings.